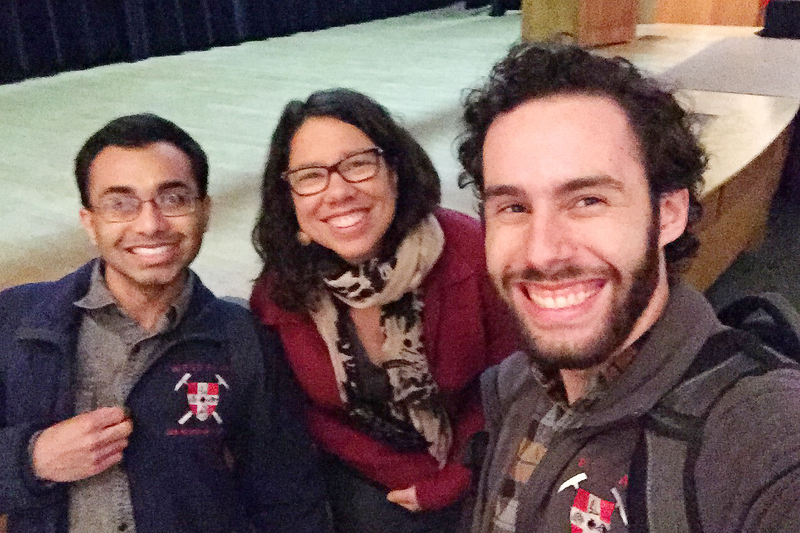 Sporting their Earth and Environmental Sciences–labeled jackets, John Hossain MA ’18 and Avi Stein ’17 posed for a photo with Professor Marty Gilmore during her recent talk at the American Museum of Natural History in New York City. Martha “Marty” Gilmore, the George I. Seney Professor of Geology and professor of earth and environmental sciences, presented a talk at the American Museum of Natural History on Feb. 4 titled “Venus: One Fate of a Habitable Planet.” Gilmore’s presentation was part of the museum’s Frontiers Lecture Series, which highlights the latest advances in our knowledge of the universe by presenting the work of scientists at the cutting edge of astrophysics. 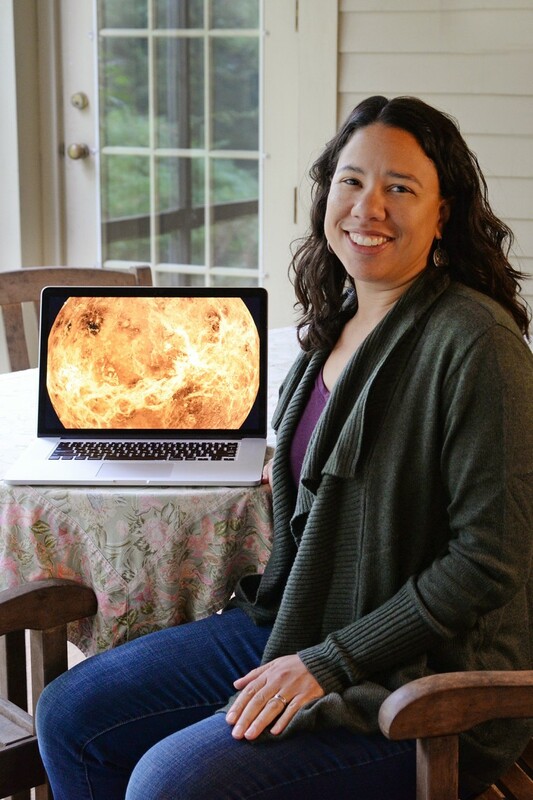 Gilmore, a planetary geologist, uses surface mapping and orbital spectroscopy to study Venus’s terrain. During her talk, she spoke about the planet’s oldest rocks and what they can tell us about the history of water on one of Earth’s closest neighbors. Gilmore supports her investigations by studying minerals formed and/or weathered under conditions on Venus. 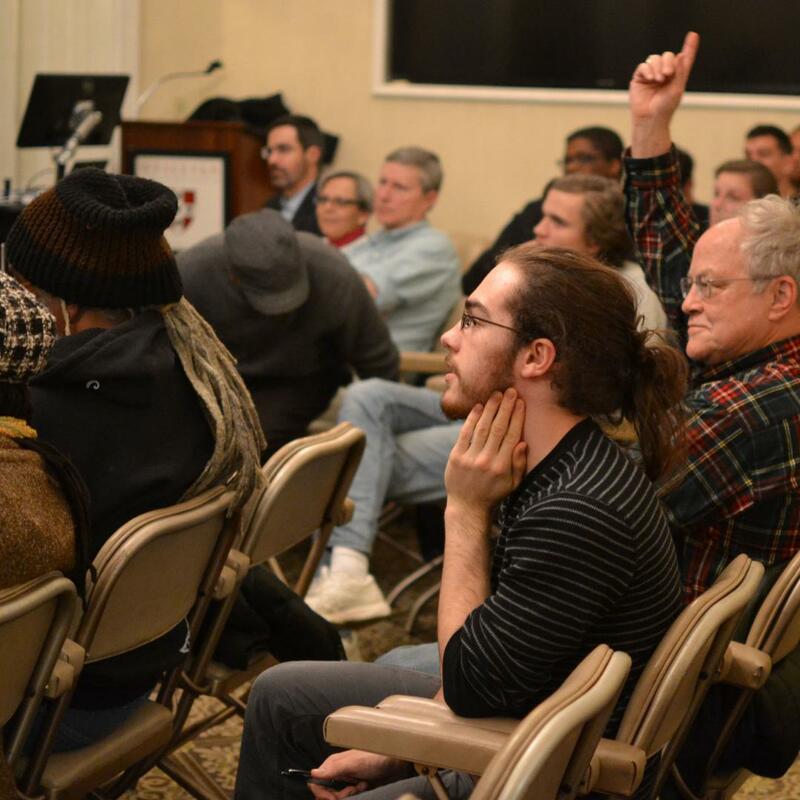 Wesleyan alumni Avi Stein ’17 and John Hossain MA ’18 attended the standing-room-only talk. Gilmore is a Fellow of the Geological Society of America. 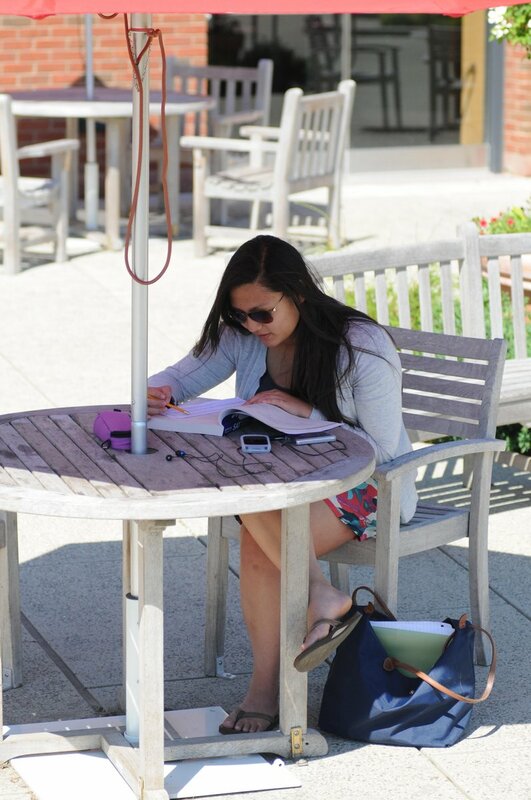 At Wesleyan, she’s also the director, graduate studies, and co-coordinator, planetary science. Like planet Earth, the geology of Venus is diverse; consisting of areas of flat plains and deformed, mountain-like terrains called tesserae. And like Earth, Mars, and the Moon, Venus is checkered with hundreds of craters. 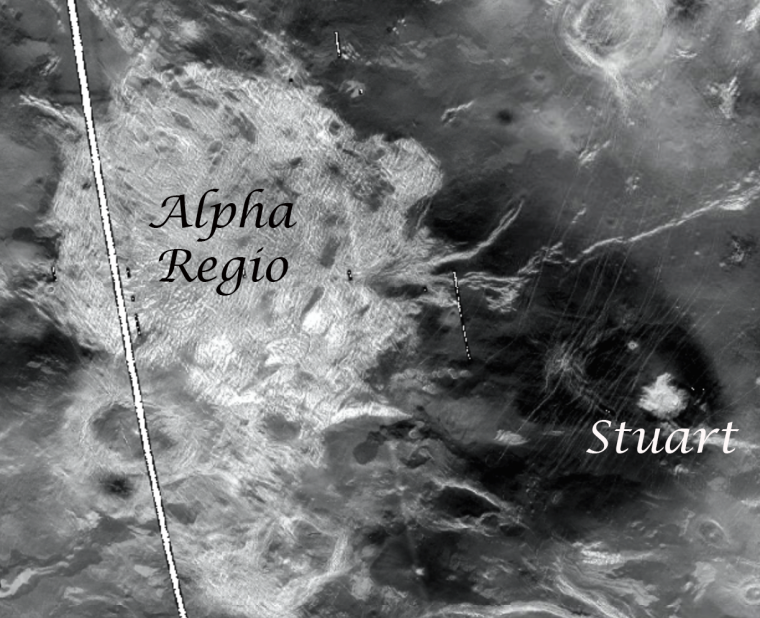 As the recipient of a three-year $430,801 grant from NASA’s Solar System Workings Program, Gilmore and James Greenwood, assistant professor of earth and environmental sciences, will use Magellan radar data to create the first map of crater ejecta on Venus classified by origin on plains or tessera terrain. Their project is titled “Radar Emissivity and Dielectric Permittivity of the Venus Surface Beneath Crater Parabolas.” Crater parabolas refer to the shape of the ejecta deposits as they are carried westward by the high-altitude Venus winds. Suzanne O’Connell, professor of earth and environmental sciences, was named a Councilor of the Geological Society of America for the GSA’s governing board. O’Connell will hold this position July 2017 through June 2021 along with two other faculty from the University of Rochester and California State University. In addition, Marty Gilmore, the George I. Seney Professor of Geology, professor of earth and environmental sciences, director of graduate studies, was elected by the GSA council to be a society fellow. Society Fellowship is an honor bestowed on the best of the profession by election at the spring GSA Council meeting. GSA members are nominated by existing GSA Fellows in recognition of their distinguished contributions to the geosciences through such avenues as publications, applied research, teaching, administration of geological programs, contributing to the public awareness of geology, leadership of professional organizations, and taking on editorial, bibliographic and library responsibilities. The Geological Society of America, founded in 1888, serves more than 25,000 members from academia, government, and industry in more than 115 countries. Through its meetings, publications, and programs, GSA enhances the professional growth of its members and promotes the geosciences in the service of humankind. GSA encourages cooperative research among earth, life, planetary, and social scientists, fosters public dialogue on geoscience issues, and supports all levels of earth science education. 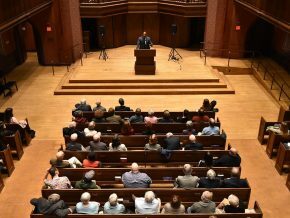 From April 27-30 the Department of Earth and Environmental Sciences hosted the 30th Annual Keck Geology Consortium Symposium at Wesleyan. The event involved several field trips to local sites of geographic significance and concluded with presentations at Exley Science Center from those who attended the field trips. Graduate student Melissa Luna examines a piece of slag left behind from the Buena Vista Iron Furnace in Canaan, Conn. Iron furnaces were an important industry in Connecticut during the 19th century. The first trip was led by Paul Olsen, the Arthur D. Storke Memorial Professor of Earth and Environmental Sciences at Columbia University. 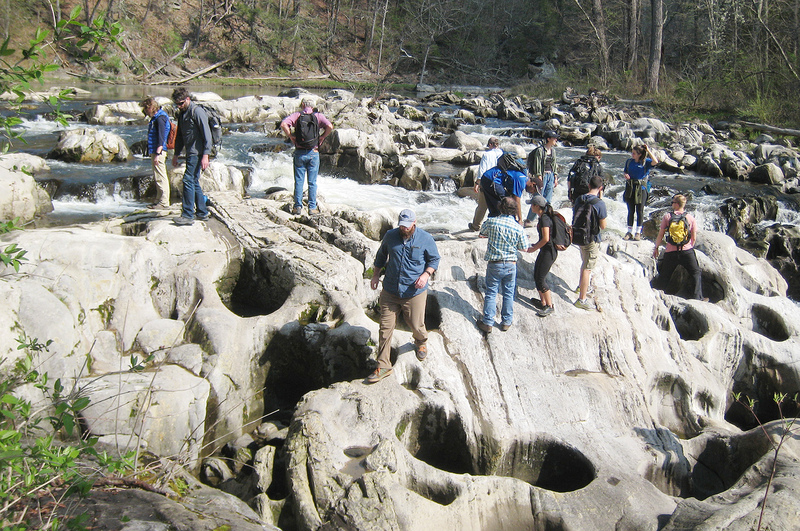 This excursion examined the Connecticut River Valley Basin for remaining traces of the mass extinction that preceded the rise of the dinosaurs 202 million years ago. 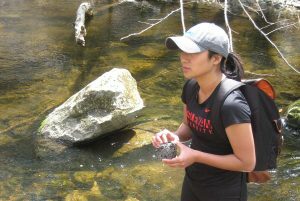 “The Connecticut River Valley Basin is one of the best places on the planet to observe the record of the biological and environmental of this mass extinction,” said Suzanne O’Connell, professor of earth and environmental sciences. The second trip was led by Will Ouiment, assistant professor of geography at the University of Connecticut. It focused on the evolution of the New England landscape from the late Pleistocene to the present. Some topics included the impact of human activities, historic land use practices and landscape adjustment following deglaciation. The trip stopped at a variety of features including waterfalls, beaver dams, river terraces and wetlands. 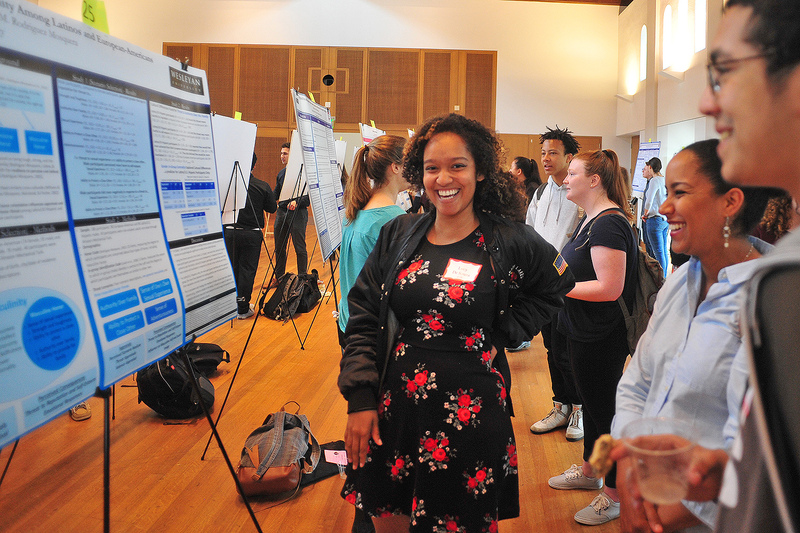 Hundreds of Wesleyan students had the opportunity to present their academic research at various poster sessions in March and April. Posters often contain text, graphics and images that illustrate the students’ research results on a single board. Poster session attendees can view the posters and interact with the author. 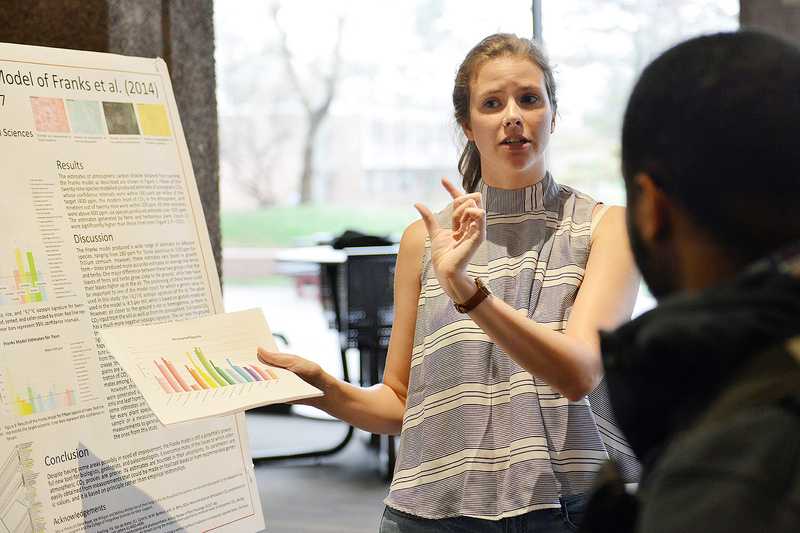 This year, the Psychology Department, College of the Environment, Biology Department, Neuroscience and Behavior Program, Natural Sciences and Mathematics Division, Quantitative Analysis Center and the Department of Earth and Environmental Sciences hosted poster sessions. Based on the senior thesis of Jared Lefkowitz ’12, “A Tale of Two Lakes: The Newberry Volcano Twin Crater Lakes, Oregon, USA,” was published online, Nov. 25, by the Geological Society of London, U.K, as part of the volume, Geochemistry and Geophysics of Active Volcanic Lakes. The study is co-authored by Lefkowitz; Ellen Thomas, research professor in earth and environmental science; and Johan Varekamp, the Harold T. Stearns Professor in Earth Science. Varekamp also is professor of environmental science, adjunct professor in Latin American studies, and chair of the Geological Society of America’s Limnogeology Division. Thomas also is the University Professor in the College of Integrates Sciences. The authors’ abstract is online here. Additionally, Varekamp contributed papers on Taal Lake in the Philippines and on the Copahue Volcano crater lake in Argentina. Both of these chapters will be published in the same volume in the upcoming weeks. Marty Gilmore accepts the Joe Webb Peoples Award at the 8th Annual Meeting of the Geological Society of Connecticut. On Nov. 18, the Department of Earth and Environmental Sciences (E&ES) hosted the 8th Annual Meeting of the Geological Society of Connecticut (GSC). 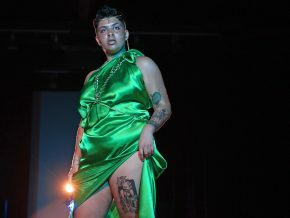 The event featured a student scholarship wine-tasting fundraiser and a public science lecture called “The Real Jurassic Park in the Connecticut Valley,” by paleontologist Robbert Baker. During the meeting, Phillip Resor, associate professor of earth and environmental sciences, Martha “Marty” Gilmore, the George I. Seney Professor of Geology, were awarded the Joe Webb Peoples Award for their efforts in hosting the 2015 New England Intercollegiate Geologic Conference. 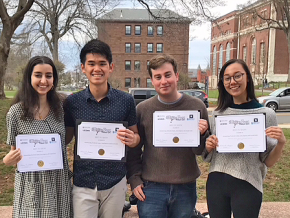 The award recognizes those who have contributed to the understanding of the geology of Connecticut through scholarship, education and service. Many other E&ES faculty were in attendance, including Dana Royer, Suzanne O’Connell, Johan Varekamp, Peter Patton and Timothy Ku. 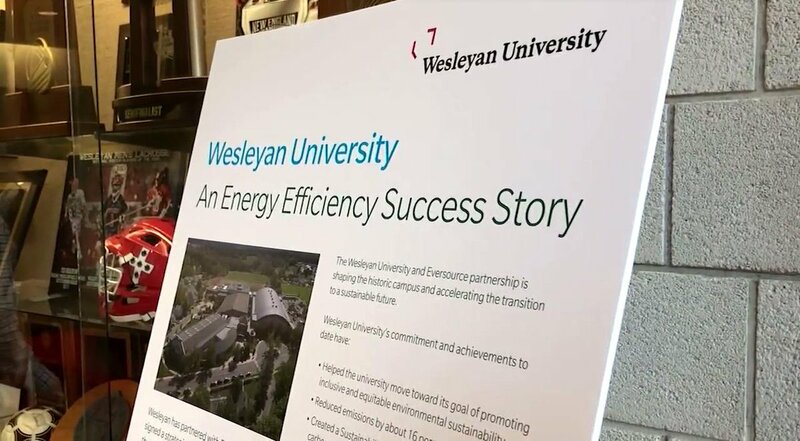 Additionally, several E&ES graduate students attended, including John Hossain, Melissa Luna, Shaun Mahmood, and alumni Bill Burton ’74, Nick McDonald MA ’75, and Peter LeTourneau MA ’85. Jelle Zeilinga de Boer, the Harold T. Stearns Professor of Earth Science, emeritus, died July 23 at the age of 81. De Boer received his BS and PhD from the University of Utrecht before coming to Wesleyan as a postdoctoral fellow in 1963. 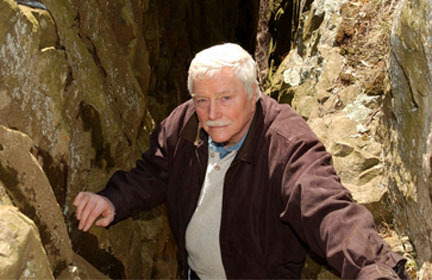 During his early years at Wesleyan he worked closely with Geology Professor Jim Balsley in the field of paleomagnetism. In 1977, de Boer was named the George I. Seney Professor of Geology and in 1984 he was named the Harold T. Stearns Professor of Earth Sciences. In the 1970s de Boer worked as a joint professor at the University of Rhode Island at the Marine Sciences Institute where he was a PhD supervisor for Bob Ballard, who found the Titanic in 1985. Ballard later invited de Boer to go diving in the submersible Alvin to collect rocks in the Cayman Trough. 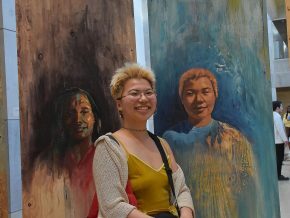 Originally interested in coming to the United States to study the Appalachian Mountains, de Boer’s research focused on the geotectonics of the Appalachians, Southeast Asia and South and Central America. Professor Gilmore is a founding member of the Planetary Science Group at Wesleyan. Martha Gilmore, George I. Seney Professor of Geology, professor and chair of earth and environmental sciences, joined legendary astronaut and engineer Buzz Aldrin and Hoppy Price of NASA’s Jet Propulsion Laboratory for a discussion on WNPR about the past, present and future of space exploration. The three were guests on The Colin McEnroe Show on May 25. Aldrin, who was one of the first two humans to walk on the moon, is the author of a new book, No Dream is Too High: Life Lessons From a Man Who Walked on the Moon. McEnroe asked Gilmore about our current level of understanding about Mars. From left, graduate student Ben McKeeby, Melissa Lowe ’17 and graduate student Shaun Mahmood met Harrison “Jack” Schmitt, the only geologist to go to the moon. Schmitt collected the samples that Lowe and Mahmood are studying. 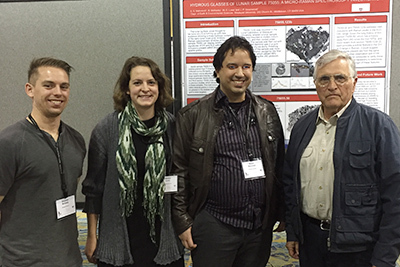 Three Wesleyan students, faculty and several alumni recently attended the 47th Lunar and Planetary Science Conference in The Woodlands, Texas. This conference brings together international specialists in petrology, geochemistry, geophysics, geology and astronomy to present the latest results of research in planetary science. The five-day conference was organized by topical symposia and problem-oriented sessions. Earth and environmental sciences graduate students Ben McKeeby and Shaun Mahmood, and earth and environmental science major Melissa Lowe ’17 presented their ongoing planetary science research at the conference. 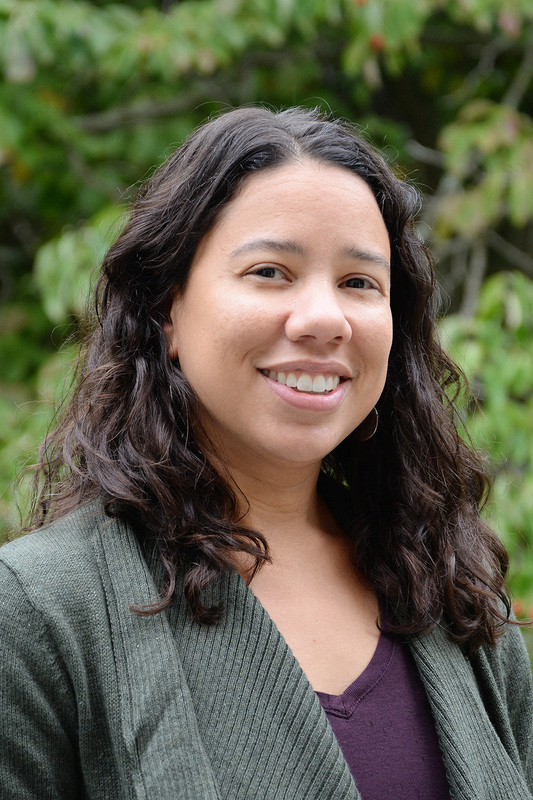 Lowe received a NASA CT Space Grant travel award to attend the conference. The students were accompanied by their advisor, James Greenwood, assistant professor of earth and environmental sciences. Greenwood presented on “Volatile content of the lunar magma ocean: Constraints from KREEP basalts 15382 and 15386.” In addition, Martha Gilmore, chair and professor of earth and environmental sciences and the George I. Seney Professor of Geology, was an author on two Venus presentations at the conference. 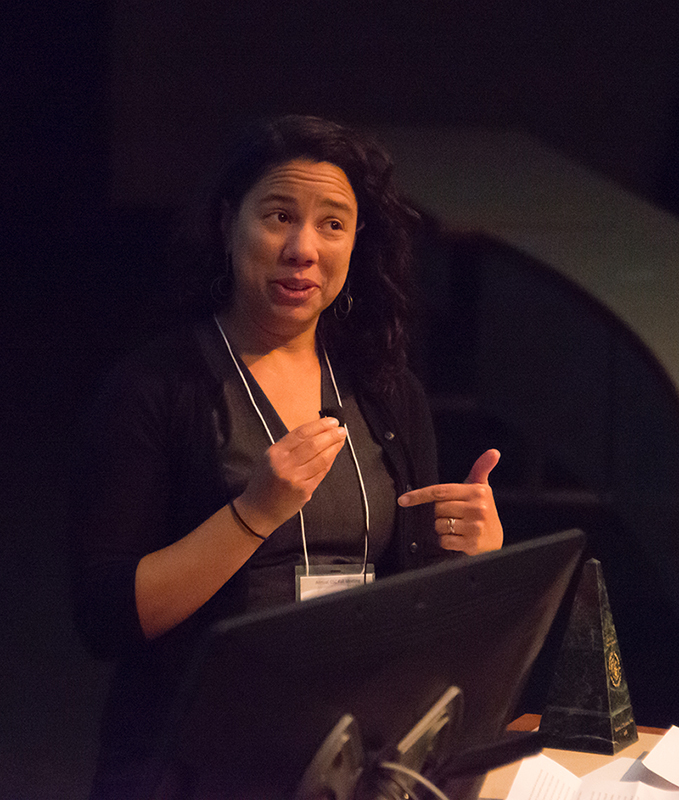 Several alumni also made contributions at the planetary sciences meeting including Ian Garrick-Bethell ‘02; Peter Martin ‘14; Bob Nelson MA ‘69; James Dottin ‘13; Keenan Golder MA’13; Tanya Harrison MA ‘08; Nina Lanza MA ’06; and Ann Ollila MA ’06. On Sept. 30, NASA’s Discovery Program selected five planetary mission investigations for study during the next year as a first step in choosing one or two missions for launch as early as 2020. Wesleyan’s Martha Gilmore is on two of the investigation teams. Gilmore, the George I. Seney Professor of Geology and chair of the Department of Earth and Environmental Sciences, is an expert on terrestrial planets. She studies the morphology and mineralogy of the surfaces of Venus and Mars using data from orbiting and landed spacecraft. She also is on the Executive Committee of NASA’s Venus Exploration Analysis Group which identifies scientific priorities and strategy for exploration of Venus. Each of the five selected investigations will receive $3 million for one year to strengthen their proposed mission by doing in-depth concept design studies. At the end of the year, it is expected that one or two of the mission concepts will then be selected for flight. 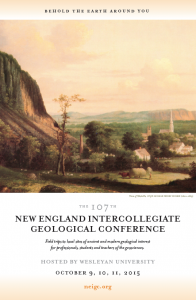 Wesleyan’s Department of Earth and Environmental Sciences is hosting the 107th New England Intercollegiate Geological Conference Oct. 9-11 on campus and in the field. 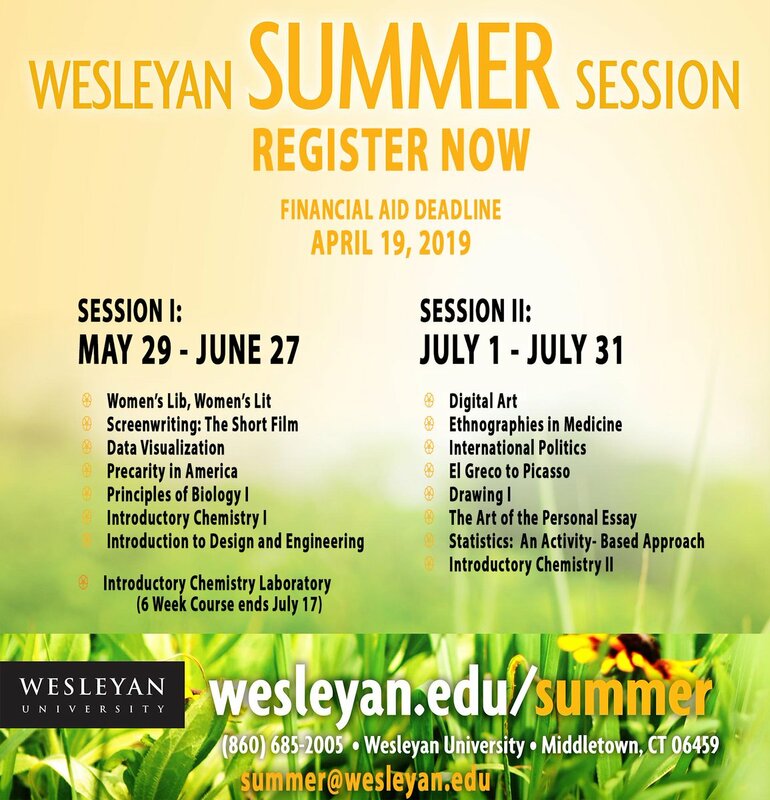 Several Wesleyan faculty, students and alumni are participating in the conference, which includes trips to local sites of ancient and modern geological interest. Participants will have the opportunity to examine tectonic slivers of oceanic terrain near New Haven; explore groundwater flow patterns and geologic deposits in Bloomfield; observe a gravel bed channel affected by a dam removal on the Naugatuck River in Waterbury; learn about the bedrock geology in Collinsville; examine common continental facies that comprise the Jurassic Portland Formation in the Hartford Basin at multiple locations; observe mineral forming geoenvironments near Trumbull; study a cranberry bog restoration in Massachusetts, and much more.